we liked hanging out outside so we could watch the lined up cars. we knew once they moved the roads were open. which finally happened at 11am. so relieved! but, i did miss my fix of farkle that night at home! thanks for the fun lowry's! the roads were supposed to open up at 3am, but when we woke up at 7am it was still closed. so we played some more! after playing outside for awhile we headed to our motel to get settled and allow the men to have a "man ride" on the snowmobiles. we were staying in little two bedroom cabins right next to each other so it was very convenient. during our down town we visited the local "mall" also known as kings and let the kids each pick out a little dollar toy. that kept them until their dad's returned and we were able eat dinner courtesy of pizza hut. we enjoyed a nice night of games and food. the next morning we shared some doughnuts and chocolate milk, packed up, and headed back to aaron's grandpa's for some more fun in the snow and a yummy lunch. our trip was coming to an end so we packed up and started our journey home...only to find that from swan valley on the highways were all closed due to blowing snow. the lowry's were about an hour behind us so we called to let them know about the roads and reserved them a cabin right next to us. so, we were able to unload and enjoy another night of games and food. wesley's choice of entertainment. he seriously would stay out there all day long. the weather was really calm in swan valley so we played outside quite a bit. the weather was so great for our adventure. owen and carson looking like birds in their masks. madalyn had a hard time moving around in her gear...but, she was warm! cheers! lots of hot cocoa to go around. last weekend our neighbor friends, the lowry family, invited us to experience star valley, wyoming with them and do some snowmobiling. of course, we would never pass up snowmobiling especially when it's combined with good company, so we jumped on the opportunity. the boys were so excited to go and have a sleep over with their buddy. we followd them there saturday morning (it is about a 2 hour drive) and the weather was perfect. the party began at aaron lowry's grandpa's home. they had three snowmobiles going and a nice sledding hill for the kids to play on. we had a nice time playing there and visiting with aaron's mom and aunt who where also there for the weekend. wesley loves everything about snowmobiling. his dad is SO GLAD! morgan and madalyn. madalyn is pretty comfortable with the lowry's (which is a great thing) and had no problem taking a little mid-morning snooze in morgan's lap. 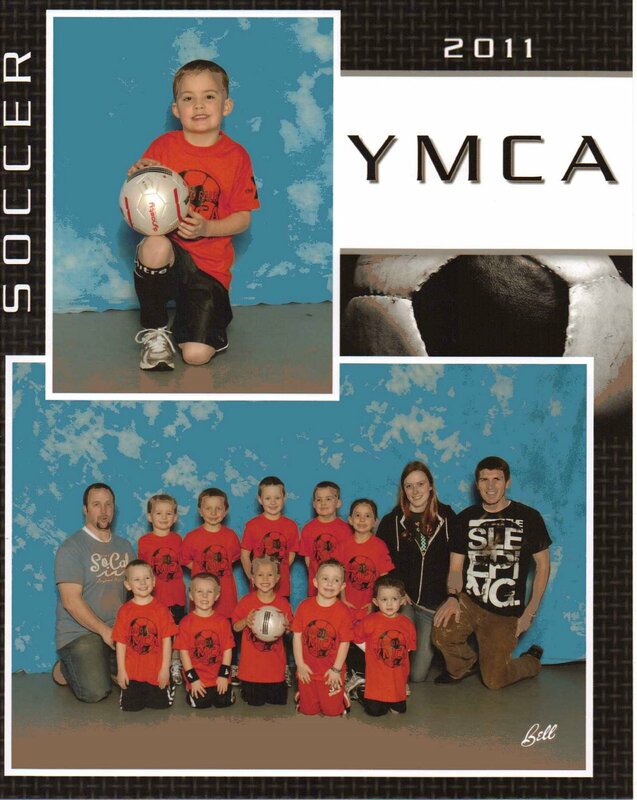 owen started indoor soccer last month. he LOVES IT! he runs hard and consistently scores at least 2 goals. a friend from church put together this little team and her brother agreed to coach. it has been so fun knowing most of the kids on the team (most of them were on owen's tball team). his best neighbor buddy, carson, is on the team too and they have proven to have a little system. carson plays goaly and will throw the ball out to where owen is waiting across the field and owen it hussle it straight down the field and score. it's hilarious when they really get going. i think soccer will be in owen's future. last night our church ward had a ward party! ROLLERSKATING! it was a lot of fun for kids and adults alike! i always forget how much fun rollerskating can be. kevin and i dusted off our roller blades and he took me for a couple spins around the floor. owen was so TIRED of falling by the end of the night. he really gave it his all. and by the end of the night he had really improved. welsey was a natural. i think he would really enjoy having his own pair of skates. thanks for the fun iona 10th ward! madalyn loves her pillow pet and keeps it close to her like a loyal pet would do. she also enjoys sleeping with it. but, madalyn's favorite part was enjoying her very own box of chocolates...and anyones box who wasn't wise enough to move it out of sight! happy valentines day everyone! so thankful for my valentine! we enjoyed a nice breakfast of waffles w/ strawberries and whip cream! i'm actually the only one who loves this breakfast, but everyone else enjoyed nice big belgian waffles with syrup! the kids have been BEGGING for pillow pets since they came out early last year. but, i never thought the fad would last long. well, i was WRONG! and so we caved for valentines day! the kids LOVE them and carry them everywhere. and i must say, they do make for a really soft pillow. sunday night kevin said he would bath the kids by himself if i made him a chocolate cake! in my opinion that is an AWESOME deal! not sure which is more irresistible. that face...or the cake! blurb book number 6 has arrived! i gained a new appreciation for my blogging habit when i lost all my pictures from all of 2010 on my computer! thank goodness i had some of them on my blog.